The Java Image Editor is a simple image editor built using Swing and the filter classes found on this site. Originally written as a test harness for my image processing classes, it's now become a fully fledged application. Brushes: paint, clone, erase etc. Blending modes - add, screen, darken etc. or the equivalent for your system. Macintosh users should double-click on the disk image and drag the application into their Applications folder, or run it directly from the disk image if wished. 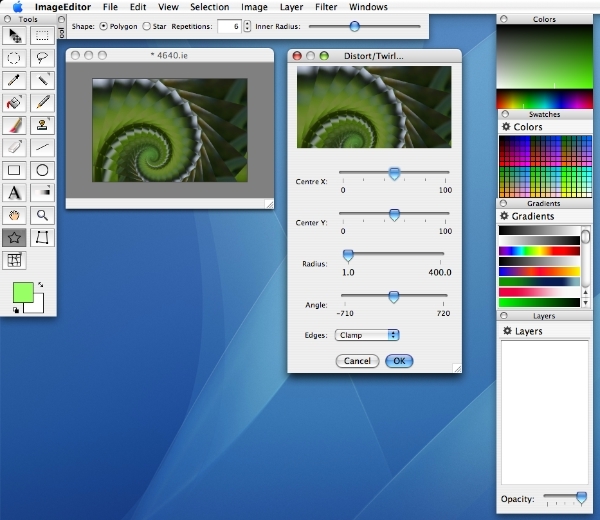 The Macintosh version uses the excellent Quaqua look and feel. This enables me to get rid of the horrible MDI interface in the Mac. On other platforms you will have to continue to endure MDI for the moment. If you run the editor as an applet in your browser, you won't be able to do much with it due to security considerations. You won't be able to open or save images. However, you can create new images and paint on them and generally get the feel for how it works. If you wanted to deploy the editor as an applet, you'd need to provide ways of getting images into and out of the editor, either by signing the applet or by adding commands to get and put images over the Web connection. This can easily be done by writing plugins. There is some very sparse documentation for the Image Editor. One day there will be more, but don't hold your breath. If you want to add your own plugin filters, here's how to do it.